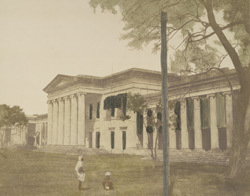 A hand-coloured print of the Hindu College, Calcutta, from the Fiebig Collection: Views of Calcutta and Surrounding Districts, taken by Frederick Fiebig in c.1851-52. This is a general view of the classical main façade of the Hindu College. The college was founded in 1817 and the foundation committee was headed by Raja Ram Mohan Roy, the great Social Reformer. As it was expanding in students and fields, in 1855 the Government renamed it the Presidency College and opened it to all students.